"Both Deputy Mayor Walcott and Chancellor Klein are dedicated public servants who care deeply about the future of the 1.1 million children in our public schools and as such, they deserve our support." The spokesperson did not address Diaz' remark, " I am afraid that you will ultimately be known as the Chaotic Educational Mayor." In an op-ed in yesterday's Daily News Bronx section, Assemblyman Jeffrey Dinowitz explains his displeasure with Gov. Paterson's nomination of former DEP commissioner Christopher Ward to head the Port Authority. Especially noted are Ward's notorious cost-overruns at DEP with the filtration plant and with the projects like the JFK Air Train when he was previously at the Port Authority. Either Ward's DEP committed the unforgivable sin of not knowing this environmental disaster was going to happen, or he kept the information off the list of project negatives to keep the approval process moving forward. Is this someone we want in charge of the Port Authority's ecological restoration? He then cites Ward's pandering to special interests and his move from DEP to the General Contractors Association of New York as reasons to think his running the Port Authority would not be in our best interests. Sen. Rev. Ruben Diaz released an open letter to Mayor Michael R. Bloomberg today, in which he denounces the Mayor's approach to education and expresses regret for supporting Bloomberg's policies in the past. Senator, I regret that decision." 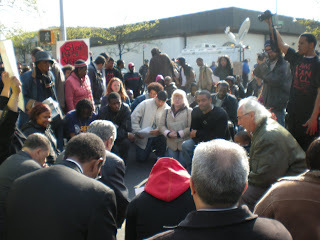 The primary motivation for the letter, according to Diaz, was a previous letter that Bloomberg ignored: In February of 2007, Diaz wrote Bloomberg to request the resignation of education chancellor Joel I. Klein as well as Dennis M. Walcott, deputy mayor for education and community development. At that time, Diaz argued that---under Klein and Walcott--students of color were suffering from schools built in polluted areas, overcrowding, and accelerated drop-out rates. 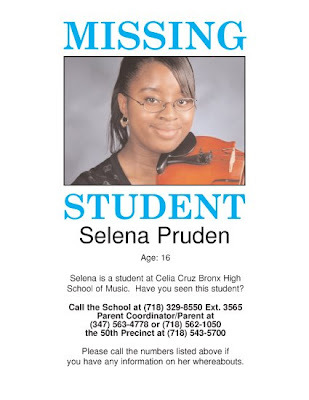 Yesterday afternoon, Selena Pruden, 16, a junior at Celia Cruz Bronx High School of Music, was found and then later reunited with her family with help from police. She had been missing since last Wednesday, May 14 and was last seen going to school carrying her viola. It's unclear what exactly happened to Selena, but Celia Cruz Principal William Rodriguez said someone had spotted her after seeing a new item about her disappearance on the cable news channel, Bronx 12. He said later last night "police interceded" and now Selena is "safely home." Earlier yesterday, Celia Cruz held an emotional assembly in support of the search effort for Selena. Her mother Geraldine Hoggis attended the assembly and spoke to students. Her daughter, Selena, was found several hours later, according to Rodriguez. More hardship beckons for tenants living in Bronx Heights' ten apartment buildings: the non-profit's supers and maintenance staff are threatening to strike because they haven't been paid in eight weeks. 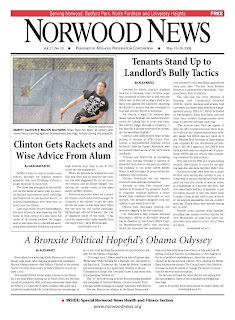 Bronx Heights (full name: Bronx Heights Neighborhood Community Corporation) is currently being sued by HPD. 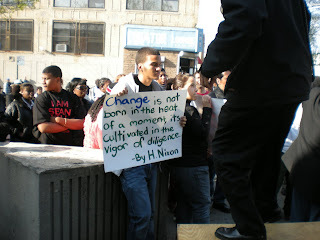 Why, exactly, isn't clear - HPD aren't saying - but several of Bronx Heights' current board members say that rent money (HPD pays Bronx Heights to manage the buildings and to collect rent) has disappeared and that the organization can no longer afford to maintain the apartments, pay the supers, or keep up with the bills. Tenants battle with a bullying landlord on the Grand Concourse. A new coach helped propell DeWitt Clinton's tennis team to the city quarterfinals. The Health Department eyes the contaminated old Fordham Library for an animal shelter. Community activists want it to become community space. Meanwhile, the city is confused about which agency controls the building's destiny. Read more. A Bronxite gives up his life to work for Barack Obama, but keeps one eye on a City Council seat. And much more, online now. In February, the Monitor profiled William Perez, a 29-year-old Mount Hope resident who’s serving in Iraq. 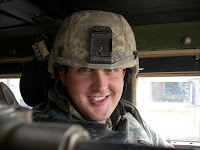 We spoke with him while he was on leave – the only one he'll get during a 15-month deployment – and he was pretty upbeat (considering he was about to leave his fiancé behind and head back to Baghdad). Recently, however, Perez has had a difficult time. On April 28, his good friend Cpl. David McCormick, of Matagorda County, Texas, was killed by rocket fire. Perez has been keeping a diary of sorts in regular emails home to his mom, Nitza Vera. Nitza wanted me to post some of these e-mails, "so the youth, and others, will know what it is really like right in the middle of a war. We take a lot for granted, and he doesn't even know if he will see the sun rise the next day. He feels at least he is sharing his deepest thoughts with his neighbors. No gang, or police brutality can compare to what he is going through right now without a warm hug in site, or a familiar face." That's how Times reporter and Bronxite David Gonzalez describes the Boogie Down in a great article/post that's up on the City Room blog right now. The article focuses on how guide books, like AAA's, have very little information about lodging and other amenities for those wishing to visit our fine borough -- and then goes on to say that our very own tourism council isn't helping, despite the fact that there is a tourism market (mostly out-of-town baseball fans coming in to catch a Yankee game) that could be taken advantage of. Gonzalez said he wanted to explore this idea after picking up a guide book in Texas and finding next to zilch written about the Bronx. What he found is that while most lodging facilities in the Bronx still cater to hourly customers, there are a couple of legit hotels that serve actual tourists. He also said the Bronx is still suffering from an outdated image problem, one that's not being helped out by our own tourism council and borough president's lack of action in remedying the problem. Until there's a real effort to repair this image problem, the Bronx will remain the Rodney Dangerfield of boroughs: Can't get no respect! The Highbridge Horizon has now posted a lengthy interview with Councilmember Helen Diane Foster on our Web site. On April 11, the Horizon interviewed Foster in her District Office on Jerome Avenue. We published excerpts of this interview in our April issue, but because the Web does not provide the same space constraints as the printed page, we offer a far more expanded version online. During the interview, Foster was typically candid, as she addressed a wide range of topics during the course of a roughly hour-long conversation. Her words about the killing of Sean Bell, and the trial of the three officers who killed him --words Foster spoke exactly two weeks before the officers were acquitted -- have echoed powerfully in recent weeks. "There is more outrage over the torturing of animals," Foster said, "than there is over the fact that another Black man is killed at the hands of the police." A little later on in the interview, she added: "I think when the verdict comes out, once again like the Diallo case, this city will be looked at and judged on what that outcome is. It appears that we keep going back to Dread Scott, where a Black man has no rights that a white man has to respect, including his own life. And if we see another acquittal in this city, it will be a sad day for all of New York City, and how we are looked at [not only] by ourselves, but by the country. " * On her relationship with borough president Adolfo Carrión: "I think it’s cordial. I don’t have any ill will towards him. I think the defining moment for me and our relationship would be around Yankee Stadium." 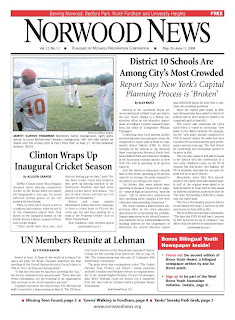 *On why she has officially decided to run for Bronx Borough President in 2009: "I think clearly that they [her constituents] wanted me to focus on the Bronx, be in the Bronx, and run for borough president. The significance of being Black and being a woman and running for the highest position as borough president of the Bronx. But I think equally as important that was heard that night is that everybody wants to be a part of it. And in years past, there has not been that inclusive feeling for the Bronx borough president." *On how to prevent gentrification from pricing Highbridge residents out of their homes: "We have what we have in Harlem, Washington Heights, and we know it’s gonna come right across the bridge. So there has to be an inventory of city-owned land that as much as possible we can look to the City Council. which has ultimate jurisdiction over it, to regulate the type of housing that goes up so that we can have a balance. We also don’t want to become the dumping ground for the shelters or only low-income housing. Because there is a correlation, obviously, with housing and school performance. We want to have multi-use, so that we are bringing dollars into the area. " On Monday we wrote about the influx of Mexican immigrants in the Norwood area as evidenced by two new Mexican restaurants. A West Bronx Blog reader asked what those restaurants were. Well, the one on Gun Hill Road (near Webster Avenue) is called La Familia. The other, on E. 204th St, is called Rio Mixteco. Enjoy! Disfruta! The Norwood News will be writing about both restaurants in the near future. Feel free to write in about any new, or particularly good, restaurants, Mexican or otherwise, in your neighborhood. "They spend the money on real projects which we need," Bloomberg said of the city's water system Monday. "From what I can tell, they do it reasonably efficiently, and this [rental relief] seems to me to be a brouhaha about nothing from a couple of people who want to run for higher office." While some of the elected officials making this point are running for higher office, that doesn't make their point invalid. In fact, those who will be sticking around in public office during the coming years realize that the problem of incresing water rates will only get worse. The easiest route for Bloomberg is to ignore the problem and let the next Administration deal with it -- so much for our visionary Mayor planning ahead to 2030! What about 2010?!? While the Water Board is also holding hearings this week (last night in the Bronx and tomorrow at 5:30 in Manhattan), they will argue that all that they actually have little control and our points should be made directly to the Mayor's office. Since the Mayor's office isn't holding public hearings on the topic, though, advocates will continue to press major points of reform with the Mayorally-appointed Water Board. Hopefully they will have the wherewithal to take our case to the Mayor, or resign in protest of what's going on -- but I wouldn't hold my breath on either count. Meanwhile, the Independent Budget Office released a report on the water rate increases this week, although they focus entirely on short-term relief. A better comprehensive look at the system can be found in the Urban Prospect (entitled Liquid Assets), released today by the Citizens Housing and Planning Council. I know, I know, some say this is a "manufactured" ethnic holiday (see: St. Patrick's Day) created mostly by big-name beer companies (see: Corona), but this is also a day of pride for Mexican immigrants and Mexican-Americans, especially on West Coast and in the southwest part of the country. Also, the Mexican population in the Bronx is expanding rapidly. Anecdotal evidence: two new authentic Mexican restaurants opened in Norwood in the past month, one on Gun Hill Road, the other on 204th Street. Disfruta! Here's a good story about the origins and celebration of Cinco de Mayo from the San Francisco Chronicle. In the United States, Cinco de Mayo is treated as a celebration of Mexican heritage, much like St. Patrick's Day is to Irishness or Lunar New Year is to Chinese culture. It's sometimes confused with Mexican Independence Day, which is actually Sept. 16, the day in 1810 when Mexicans first declared their intention to be free from Spanish rule. Cinco de Mayo is not a Mexican Fourth of July, and it's not "Drinko de Mayo," as the beer companies have tried to fashion it. In fact it celebrates the Battle of Puebla on May 5, 1862, when a ragtag Mexican army fought off an attack by the larger and better-equipped French force sent by Emperor Napoleon III to conquer Mexico. The French, along with Spanish and English troops, had invaded Mexico in 1861 after Mexican President Benito Juarez declared he was suspending payment on the country's foreign debts. The Spanish and English withdrew after negotiating settlement of the debt. But Napoleon, hoping to gain a foothold in the Americas to counter the growing power of the United States, ordered his troops to attack. At the Battle of Puebla, in central Mexico, 2,000 Mexican troops successfully defended their forts against 6,000 French soldiers. They won the battle, but Napoleon won the war, installing his cousin Maximilian as emperor of Mexico. It wasn't until 1867 that he was deposed and Juarez regained the presidency. On Saturday, Bronx residents continued to demonstrate their anger over the acquittal of the three police officers who killed Sean Bell. About 45 people—including teenagers, seniors, and those in between— marched through Soundview. 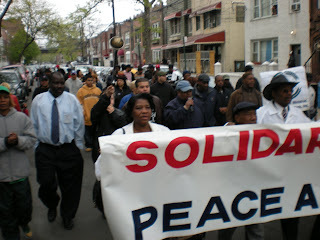 The roughly 30-minute procession began in front of 1157 Wheeler Avenue – the building where Liberian immigrant Amadou Diallo was killed in 1999 by four NYPD officers— and concluded at the 43rd Precinct. A brief rally was held at the 43 after the march. Protestors observed a moment of silence for Diallo before beginning their trek down Wheeler Avenue. 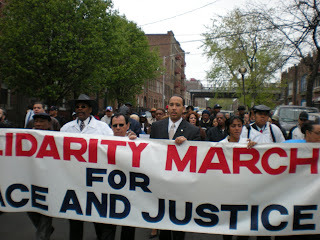 The march was called, and led, by Assemblyman Ruben Diaz Jr.
“It seems to us that the only difference nine years later is that there were nine more bullets fired, ” Diaz told the crowd outside the 43rd Precinct, comparing the 41 shots fired at Diallo to the 50 bullets pumped at Bell. As was the case with Wednesday’s rally in Highbridge, a major theme expressed at Saturday’s demonstration was that—given the history of fatal shootings, abuse, and harassment by law enforcement against persons of color—what happened to Sean Bell could easily have happened to any Black or Latino male. 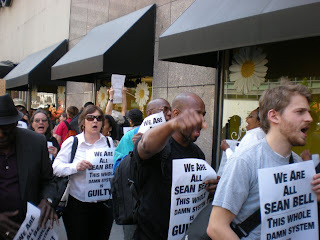 Demonstrators chanted “I am Sean Bell,” in addition to “I am [Anthony] Baez,” “ I am [Abner] Louema,” and “I am Amadou [Diallo],” referring to other victims of high-profile instances of police shootings and brutality. Marchers also sang the Civil Rights Movement anthem “We Shall Overcome,” and counted from 1 to 50 to represent the number of shots fired at Bell and his friends. In front of the precinct, Diaz noted that Judge Arthur Cooperman had cited the “demeanor” of Bell’s friends Trent Benefield and Joseph Guzman--as well as other prosecution witnesses--during the trial as a factor in his decision to acquit Officers Marc Cooper, Gescard F. Isnora, and Michael Oliver. Diaz echoed the Rev. Al Sharpton’s calls for the creation of an independent prosecutor to prosecute cases involving police shootings. As the rally in front of the 43rd Precinct wound to a close, this reporter was approached by Gloria Cruz, whose 10-year-old niece Naisha “Nana” Pearson was killed by stray bullets in Mott Haven in September of 2005. Cruz has since quit her retail job and devoted much of her life to efforts to rid the streets of illegal guns; in fact, she was in Washington D.C. lobbying Congress on this issue when she learned of the acquittal of Cooper, Isnora, and Oliver. She said she was “dumbfounded” and “upset” when she heard the verdict. The Rev. 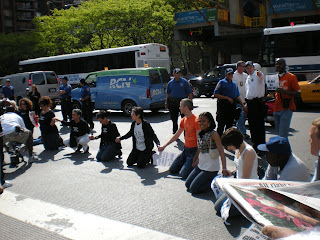 Al Sharpton has called for citywide acts of civil disobedience this Wednesday May 7, in protest of the acquittal of the three officers. Sharpton announced that protestors will gather Wednesday afternoon at six locations throughout the city for a “pray-in” that will involve blocking traffic. According to NY1, The spots Sharpton announced are: Third Avenue at 125th Street; Park Avenue at 34th Street; Third Avenue at 60th Street; Varick and Houston Streets; One Police Plaza; and 415 Atlantic Avenue in Brooklyn. 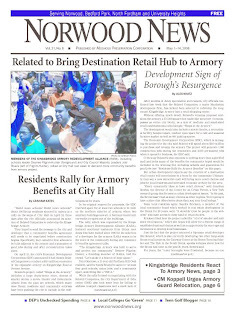 Ladies and gentleman, just in time for the weekend, I give you the latest stories from the Norwood News, featuring wall-to-wall Kingsbridge Armory coverage. Council Member Maria Baez chooses to let worst attendance record speak for itself. Monroe unveils it's new business school building. The DEP's unchecked spending habits. And much more...at the Norwood News' award-winning new Web site!